More than two weeks ago I downloaded and watched Michael Moore’s new documentary Sicko. Yes, I download movies and fortunately Moore has given people his blessing to do so with this documentary given the urgency of the topic it address. Even if you are not a big fan of his previous repertoire of liberally slanted films, take a deep breath and take the plunge. You will be glad you did. This documentary does go beyond party lines. Healthcare is not a partisan issue. Sickness does not care if you are liberal, conservative, black, white, in shape or morbidly lazy. The documentary boils down to one question. Why do we allow companies motivated by profit to make decisions about our health? This simple question has deeper social implications. We pay taxes to operate social services not for profit, but because they serve community for a benefit on the whole. The fire department, police department, and education system are socialized constructs that currently exist in our society to operate on this principal. Would including health care not also serve society at large? Canada, England, France, and a number of other countries have been able to grasp this concept with great success. Yet the private and public sectors of health care in these countries coexist with each other. Moore takes his cameras across the borders in search of a better way of doing things. In England patients furled their brows when asked how they were going to pay for their medical expenses. The concept was absolutely foreign to them. Moore repeats the process in France and Canada with the same results. By far the most touching section of the film is Moore’s trip to Cuba. This move has landed Moore in hot water with the US government given the long standing (and impotent) trade embargo still in effect. The surprising thing to remember is that this movie is not about those who do not have insurance, but those who do. The unfortunate Americans in the movie all came from middle-class backgrounds and believed themselves to be covered for the worse. It was chilling to hear some of their stories. Should the first question we ask en route to care not be “How do I get better?” It would be a welcome change to the standard “How do I pay for this?” Go see the film out in theaters now… or download it. It is worth your time. What is the fastest, most reliable, and cheapest way to ship a package overseas? It isn’t FedEx. My family shelled out $270 USD to ship a package from Green Bay, Wisconsin to Marburg, Germany. I recommended using UPS or DHL for better results, but I can understand my mother’s concern. She is a nurse, after all, and the contents of the package are things that I cannot live without. It contains insulin, syringes, and blood glucose strips to treat diabetes. Mind you that insulin should not go without refrigeration for an extended period, hence the steep amount of money paid for post haste delivery. The package was dropped off on June 7. After some time I began to get worried when nothing showed up. Naively I told myself that this kind of stuff happens all the time. People here have shared similar stories of packages originating from the United States not arriving on time. So I filed the thought in the back of my mind until more pressing issues were resolved. When I finally checked the status on their website and it read “Clearance Delay.” I called FedEx and they told me that they required a copy of my plane ticket, a copy of my passport, and a written statement before it could be sent out. I would have to fax all of these details to Frankfurt. 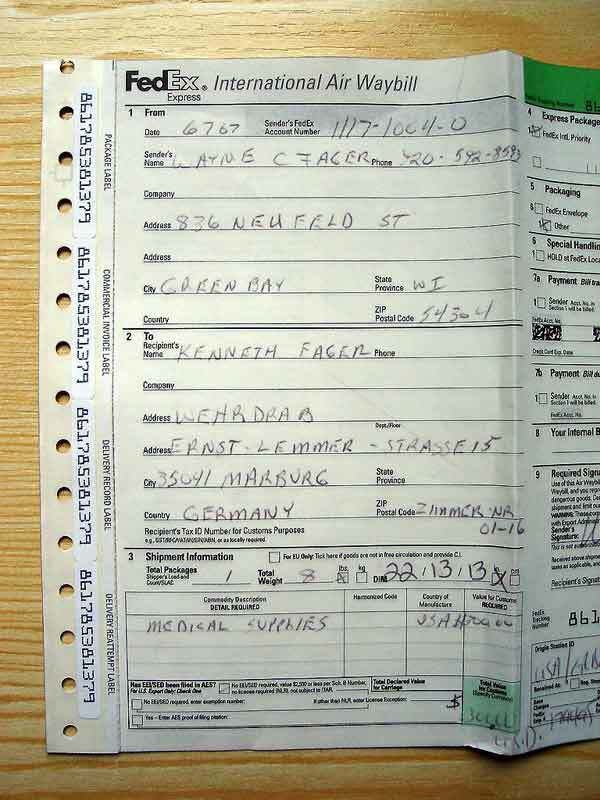 Getting a copy of my ticket, a copy of my passport, and a written statement faxed out took quite some time and 0.90 Euro. After all was said and done I called FedEx the next day to ensure that they received my fax. They confirmed and I breathed a sigh of relief. All should be well. Insulin is something you cannot live without and, unfortunately, my pancreas staged a successful coup de tat 13 years ago. I have no choice in the matter than but to pay this fee. The proposition of living for close to a month without proper medical treatment would be detrimental, if not downright fatal. Anticipating the collection of dues I walked down the street to the closest Sparkasse ATM and withdrew 100 Euro. I know exactly what the exchange rate was at that moment because my online account says I took out 134.63 USD. So 69.41 Euro after the exchange rate comes to 93.45 USD. Tack 1 USD onto that for the ATM fee. But why the 69.41 Euro fee? When you send goods German customs charges a Duty-and-Tax Reclaim fee according to the “Ancillary Clearance Fees – Germany” page on fedex.com. I would like to think that the local Wisconsin FedEx representative informed my family of this nominal fee before agreeing to ship the package, but my instinct tells me that they did not. Nor did I have any indication on the tracking page to suspect any sort of impending fees. What happens when the delivery person arrives at the door and John College-Student has nothing but pocket change for laundry handy? Is it not logistically then more expensive for the shipping company to pay the man-hours to redeliver the parcel? Seething to the brink with anger I informed FedEx that I would be home Friday, June 22 in the morning. They said that the delivery would come between 8 a.m. and noon. 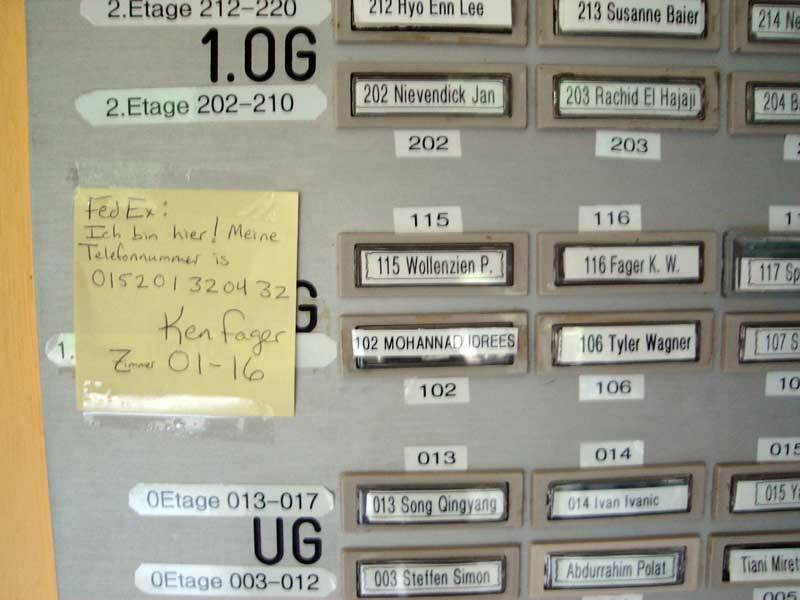 Just for extra precaution I put a note with my cell phone number on it next to the doorbell. Shortly after noon I received an e-mail update on the status of my package. What could it be this time? “Incorrect address.” The FedEx representative on the other line rattled off the address on the package to me line by line. Kenneth Fager. – That’s me. House number 15? – You bet. Please note that the delivery person was able to locate my living quarters when I was not home on Wednesday, but unable to successfully locate it on Friday. Locating a correct address with “faulty” information is a spectacular feat. Being unable to locate an address with correct information after previously being there boggles the mind. All this drama, despite the note next to my name on the doorbell that said I would be there and had a phone number to call. The representative said that they would call back in a few minutes after this situation was worked out. Slightly over an hour later I received a call that the package would be delivered on Monday, June 25 between 8 a.m. and noon. For some reason I had my doubts that this would be accomplished. Monday morning and I am wide-awake at 8. For some nagging reason I cannot fall back to sleep. I went downstairs to check to see if my note was still down there. Yes, it is. Now all I have to do is wait some more. By noon there was still no package in my possession and I wasted no time calling FedEx. They assured me that the package is en route and would be delivered by 5 that evening. Finally, at 2:20 p.m., a delivery person showed up with my package. The first thing I noticed was that he was not wearing a FedEx uniform. I did not quite catch the name of the delivery service, but do recall being rather offended by the idea that FedEx may have passed the buck on this one. I forked over the 69.45 Euro and headed back inside. Fortunately the contents of the package arrived in sound condition. The accompanying paperwork outside the box made everything clear. The invoices filled out and signed by my father have the correct information verbatim. The accompanying statements from my doctor also have the correct information verbatim. 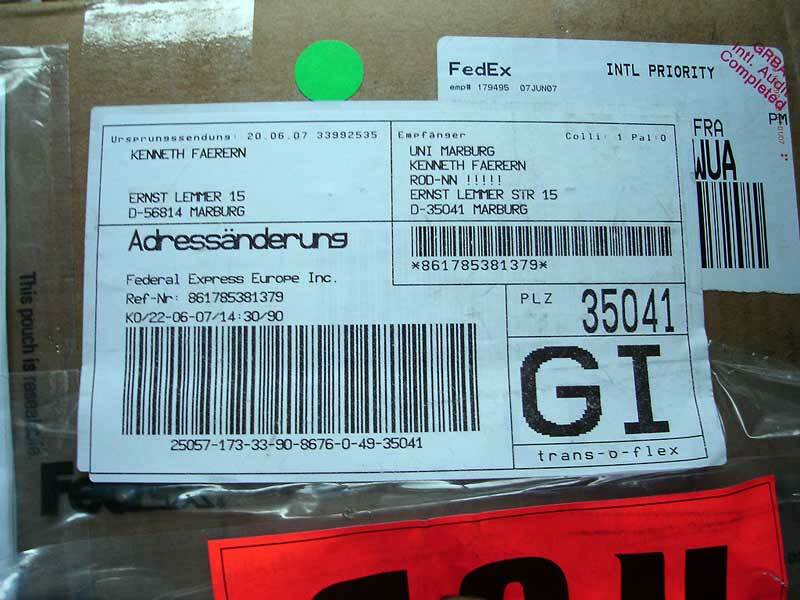 It was not until the package arrived into the possession of Federal Express Europe, Inc. that things got messed up. They copied my information incorrectly on their delivery sticker. Kenneth Fager suddenly became Kenneth Faerern. Keep in mind that my correct name and address were visible all over the package in multiple places. The thing that really gets me going about this whole situation is that FedEx never informed me of the problems with my package until I contacted them. Every step of the way I had to poke and prod them. Every day that my package sat waiting for clearance and delivery, charges were stacked up without my knowledge. What kind of customer service is this? My insulin has been sitting God-knows-where for over two weeks degrading every moment it is not in cold storage. I just hope the vials have not been baking in some delivery truck. I have just enough supplies to last a week. I literally am on my last vial of NPH and blood glucose test strips. It just may have been easier and cheaper to ship each item innocuously via regular mail. FedEx’s website has a page that outlines their mission statement. Under “loyalty” it says, “We earn the respect and confidence of our FedEx people, customers and investors every day, in everything we do.” I believe their pledge of loyalty to the customer to be an absolute farce. They have not earned my respect or confidence, but instead robbed me of time and given me nothing but stress for the past week. This scenario is more than likely an exception to the rule. However, as a frequent seller of goods on eBay, I now refuse to consider FedEx as a shipping option. I hereby will not recommend their services and will go out of my way to avoid using them. If you have a package to ship overseas your best bets are going to be UPS or DHL. I can say with a certain degree of assurance that when I had problems shipping goods in the past, UPS and DHL were quick to rectify the issue. How utterly fitting. Part of my private education can be summed up in its entirety with those three words. My least favorite teacher bore that word as a last name. Oh, the irony. A big heartfelt thank you goes out to the reader who donated while I was away in Munich. Visiting Bavaria was a tad expensive, but well worth it. I will be eating frugally until I leave Germany in early August. Along with the 5 Euro in bottles I brought back for a refund, you paid for the following food items. Looking at this list you may ask, “Is beer really necessary?” Yes. Yes it is. At only 0.70 Euro at the grocery store it is. At the local pubs a beer that size will set you back on average 2.75 Euro. I don’t normally discuss family matters on my site as a rule, but this also warrants mention. Special thanks to Mom and Dad who forked over $270 to FedEx in order for my prescriptions to arrive in an orderly fashion. A while back I was wandering down to the Museumsufer (museum district) of Frankfurt when I came across a most peculiar church. As John Q. Potentialnewbeliever walking down the street, how inviting does this look to you? 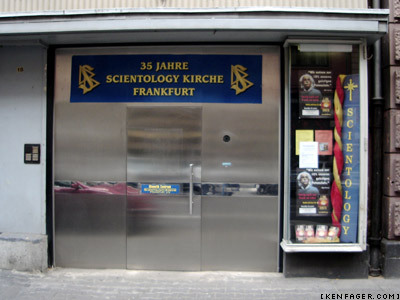 This is the heart of Scientology in Frankfurt. I’m really not suprised that their main street-level door would be sheet metal with an ominous camera hole. The Bundesregierung (government) does not officially recognize Scientology as a religion for good reason. They have all the markings of a highly organized totalitarian cult. Scientology is a religion founded by L. Ron Hubbard in which members have to pay to advance to the highest level. Tom Cruise and John Travolta are the to two most famous celebrities involved in the religion. Obviously for everyone else without the clout the financial hurdle makes it a bit difficult to obtain the highest level. Not only does Scientology sqeeze money out of its followers, but it also harasses anyone who attempts to investigate the cult. The BBC recently ran a controversial piece on the program Panorama. The Church also has been waging an ongoing crusade against internet websites such as Operation Clambake. This site regularly gets DMCA take-down notices sent to major search engines, which temporarily block access to anyone looking to brush up on Scientology facts. If you are looking for an entertaining way to find out just what Scientologists believe, I highly recommend the South Park episode entitled “Trapped in the Closet.” If you live the L.A. area you can wander on over to the Scientology Museum installation called Psychiatry: An Industry of Death, where they claim that Psychiatry is nothing but Nazi science. I would need a steel door on my church too if I made such ridiculous claims.